This study of the subgenus Neosuraius initiates a much needed revision of the neotropical genus Chrysopodes. The study begins by re-defining the suite of traits that characterizes the subgenus; in doing so, it limits the taxon to a cohesive set of species. Then, because most previous descritptions were brief and did not refer to the genatalia, it re-describes and illustrates the adults of all species assigned to the newly re-defined subgenus. 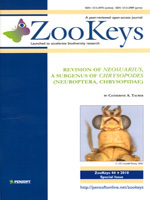 A key with illustrations is provided to facilitate identification of Neosarius species. For each species, the publication includes a diagnosis, complete synonymy, list of literature citations, and information on the distribution and known biology. To stabilize the subgenus and reduce nomenclatural problems in the future, special emphasis is placed on the type specimens of all species in the subgenus and their synonyms. Taxonomic changes include: (1) One previously synonymized species is recognized as a valid biological entity. (2) Five species are removed from the subgenus. (3) Six species are synonymized with previously described C. (Neosaurius) species. (4) Lectotypes or holotypes are identified for all species and synonyms.